Brief：The establishment of the China-Caribbean Economic and Trade Cooperation Forum has opened new prospects for cooperation between the two sides. In the next three years, the Chinese government will take six policy measures to deepen cooperation with the Caribbean countries. It gives me great pleasure to come to the beautiful city of Port of Spain. Let me extend, on behalf of the Chinese government, warm congratulations on the opening of the 3 rd China-Caribbean Economic and Trade Cooperation Forum, and heartfelt thanks to the government of Trinidad and Tobago for the thoughtful arrangements. I would also like to express high tribute to our friends who have long been dedicated to promoting economic and trade cooperation between China and the Caribbean. There has been a sound momentum of development in our relations in recent years. There have been frequent high-level exchanges between us, and political mutual trust has continued to deepen. We enjoy fruitful cooperation in economy, trade, investment, tourism, agriculture, science and technology, and infrastructure. The establishment of the China-Caribbean Economic and Trade Cooperation Forum has opened new prospects for cooperation between the two sides. Since its inception six years ago, our cooperation in all fields has embarked on a fast track of development. Two-way trade has been growing at an annual rate of 24% on average and reached US$7.2 billion in 2010, and the accumulative Chinese investment in the Caribbean now stands at US$400 million. China, being a developing country itself, has provided assistance within its capability to the Caribbean countries without attaching any conditions. We helped to build a number of public facilities and projects related to people's well-being. We helped with the training of 1,700 officials and technicians, and dispatched 200 agricultural and medical experts and young volunteers. Facts have proven China to be a forever true friend and cooperation partner of the Caribbean countries. The underlying impact of the international financial crisis is still lingering and the global economic situation is extremely complex and uncertain. Against such a backdrop, enhancing cooperation in various fields between China and the Caribbean will go a long way in promoting economic development in our respective countries and ensuring world economic recovery. In the next three years, the Chinese government will take the following six policy measures to deepen cooperation with the Caribbean countries. First, we will enhance financial and investment cooperation. China will provide US$1 billion in loans of preferential nature to the Caribbean countries in support of local economic development. China encourages exchanges and cooperation between the commercial banks of the two sides. The China Development Bank will set aside US$1 billion to be used as special commercial loans for infrastructural development. China wants to discuss and sign an investment protection agreement with the Caribbean countries to promote two-way investment. China will also make a donation of US$1 million to the CARICOM Development Fund. Second, we will step up capacity building cooperation. China will provide no less than 2,500 training opportunities for the Caribbean countries and 30 opportunities with master's degrees for Caribbean professionals to study in China. To help enhance Caribbean countries' capability to fight natural disasters, China will provide support in the building of seismic or tsunami early-warning and monitoring networks and provide training on disaster mitigation and prevention. Third, we will strengthen cooperation in environmental protection and new energies. China will enhance exchanges and cooperation with Caribbean countries in such fields as environmental protection and new energies. We stand ready to help Caribbean countries build small-scale new energy projects such as those with solar power. Fourth, we will intensify cultural, educational and health cooperation. China will build friendship schools for Caribbean countries and provide assistance in terms of Chinese language teaching, teachers and textbooks. We will continue to provide scholarships to Caribbean countries and stand ready to negotiate the signing of agreements on mutual recognition of diploma and degrees with Caribbean countries. We encourage schools on both sides to forge sister relationships. We will continue to send medical teams to Caribbean countries and provide training for your doctors and nurses. We also stand ready to beef up cultural exchanges with Caribbean countries. Fifth, we will promote closer trade and tourism cooperation. The Chinese side will support the Caribbean countries in increasing exports to China and diversifying export mix. We encourage Caribbean enterprises to come to China for important exhibitions and trade fairs to promote their products with competitive advantages. Likewise, we also encourage Chinese enterprises to go to Caribbean countries for exports expositions to increase their imports from Caribbean countries. We will promote trade facilitation through strengthened cooperation on import and export inspection and quarantine and other means. We will continue to encourage chambers of commerce, business associations and enterprises on the two sides to step up cooperation and exchanges. The Chinese side stands ready to intensify cooperation with the Caribbean Tourism Organization, assist tourism authorities of Caribbean countries in holding tourism promotion events in China and encourage more group travels by Chinese citizens to the Caribbean. Sixth, we will boost cooperation in agriculture and fisheries. 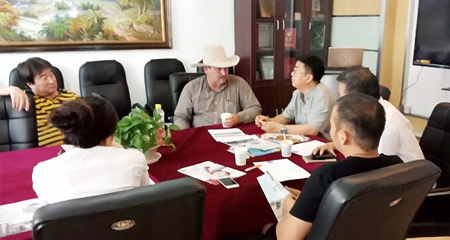 The Chinese side will continue to send agricultural experts to Caribbean countries and run agricultural and fisheries demonstration projects there. China's Ministry of Agriculture will sign the Common Initiative on Agricultural and Fisheries Cooperation with the agricultural authorities of Caribbean countries and set up the China-Caribbean Working Group on Agricultural and Fisheries Cooperation so as to promote cooperation in farm produce processing and trade, agricultural and fishery investment, agricultural human resources development and agricultural research and development. Thanks to more than 30 years of reform and opening up, China has scored remarkable achievements in economic and social development. Now, we are implementing the 12th Five-Year Plan. Acting on the Scientific Outlook on Development, we are working to transform the development pattern, adjust the structure, expand domestic demand and improve people's livelihood. We are endeavoring to ensure appropriate structure, high quality and good returns of economic development while sustaining reasonable growth rate. The comprehensive economic and social development in China will not only benefit the Chinese people, but also bring opportunities to the Caribbean and the larger world. China cannot develop itself in isolation of the world and the world needs China for its development. China will stay committed to the path of peaceful development and steadfastly follow the win-win strategy of opening up. We will, as always, support Caribbean countries in promoting economic development, improving people's livelihood, advancing regional integration and playing an active role in international affairs. 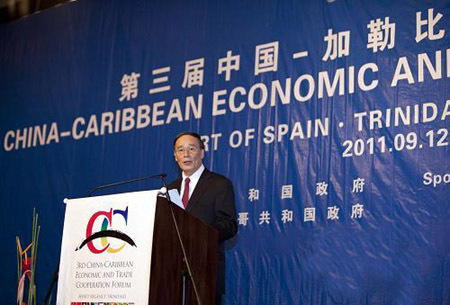 Enterprises are the main players in China-Caribbean economic cooperation. The Chinese government will work with the governments of the Caribbean countries to create an enabling environment for business cooperation between companies of our two sides. I believe that all of you as business leaders with vision and wisdom will seize the opportunity provided by the forum, turn cooperation prospects into real success stories and inject fresh vigor and vitality to China-Caribbean friendship and cooperation. I wish this forum a full success.